Acid treated starch or Acid-thinned starch. Granular starch slightly hydrolysed with acid at low temperature. Acetyl value. Acetyl value of a modified starch is % of acetyl groups calculated on starch dry matter. Method: ISI 14 Determination of Acetyl. Content. Adjunct. Malt substitute. Adjunct syrup is used as a brewing supplement and booster - see wort syrup. Alkali lability. Substituents of a modified starch removable by hydrolysis with alkali is titrated. Method: ISI 23 Determination of Alkali Lability. Alkali number. Alkali Number is a measure of the average molecular weight of the starch and expressed as ml 0.1N sodium hydroxide, consumed under test conditions. Amaranth. Amaranth - a common name used for plants with blossoms that do not readily fade when picked. Amphoteric starch is modified starch which both cationic and anionic substituents. f.e. cationic potato starch. Amylose. The minor constituent of starch is amylose - a linear glucose polymer with alpha 1-4 glucosidic bonds only. Amylose may contain 200-2000 anhydroglucose units. Anhydroglucose unit The glucose unit of amylose and amylopectin minus one molecule of water. Baum (oBe). Density is measured in Baum: oBe = 145 - 145/specific gravity at 60 oF. The commercial Baum = oBe + 1 is used within the glucose industry. Baum tables. Brabender. Brabender Viscograph is the industry standard in determination og starch viscoisty. Brix. Brix (oBx). Percentage (w/w) of a sucrose solution. See table for conversion: Beaume - Brix - Dry matter of Glucose Syrups. Carbohydrate. Monosaccahrides or natural organic substance giving monosaccharides by hydrolysis e.g. starch, sugars, cellulose, glucose, fructose, maltose. Carbon treatment. Activated carbon is used for decolorization and purification of hydrolysates. Chiral Means "handedness" - A chiral or asymmetric molecule is one which can be distinguished from its mirror image. CIP Cleaning In Place - Read TM 23 CIP. Curdlan - a fermentation-produced polysaccharide as is Xanthan, and Gellan. CWS Starch. - Cold Water Soluble Starch are made by cooking and spray drying or by alkali/alcohol technology to allow for hydration without cooking. Starches labeled instant, granular or cold water-swelling are made that way. Derivative. Another term for chemically modified starch e.g. oxidised starch. Dextrin. Industrial dextrin is granular starch with molecules reorganised by roasting causing the granules to be cold water soluble. Depending on the degree of roasting dextrins are grouped as White Dextrin, Yellow Dextrin and British gum. Dextrose. Synonym for glucose. Within the industry dextrose is used to describe 100 % pure glucose. Both the anhydrous and the monohydrate form is used. Dextrose anhydrous. The crystalline form of pure a-D-glucose. Produced from high DE syrup by crystallization above 60 oC. Enzyme. Three groups of enzyme catalysts are used in the glucose industry: (1) Alpha-amylase for liquefaction, (2) Amyloglucosidase for sachharification and (3) isomerase for conversion of glucose to fructose. Enzyme conversion. A two step hydrolysis: Liquefaction with a-amylase and saccharification with amyloglucosidase. Fructose. Fructose Alpha-D-fructose is an isomer of alpha-D-glucose. Standard fructose syrup contains as much as 42% fructose and enriched syrups as much as 55%. High concentration of fructose is achieved by chromatography. Gellan Gum is a water-soluble polysaccharide produced by Sphingomonas elodea. It is used as a food thickener, emulsifier, and stabilizer. It has E number E418. HFCS. HFCS = High Fructose Corn Syrup is identical to HFSS. HSH. Hydrogenated starch hydrolysates (HSH), - polyglycitol syrups - are found in a variety of foods. They serve as bulk sweeteners, viscosity or bodying agents, humectants (moisture retaining ingredient), crystallization modifiers etc. just like sorbitol. HSH and sorbitol are made the same way, but from starch hydrolysates of different Dextrose Equivalent (DE) and different composition. Liquefaction. Partial hydrolysis of cooked starch followed by a viscosity reduction. Depending on the catalyst the DE of the liquefied starch is 15 - 25. Maltodextrin. Liquefied starch below 20 DE. Food applications as a carrier and extender. MSG. Monosodium Glutamate (MSG) is made by fermentation of starch sugars. It is also known as the "third spice". Mung bean starch has 37% amylose and produces a strong gel. Mung bean starch is the prime material for making clear starch noodles, however, it is much more expensive than tapioca starch often used as a replacement. Native starch. Native starches designate starch in its natural unmodified form no modification, e.g. native starch from potato, cassava, maize, rice, wheat. Plantain. Banana make up the genus Musa of the family Musaceae. 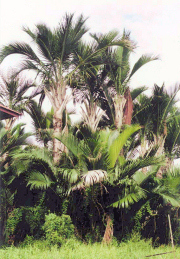 The plantain, or cooking banana, is classified as Musa x paradisiaca. Polyol. Polyol - polyglycitol - is a family of sugar alcohols such as sorbitol, mannitol etc. Like sorbitol, they have a wide range af applications. Protamylasse. Protamylasse is a residual compound occurring during the industrial production of starch from potatoes. Typical analysis: Dry matter 32,6 pct, TS; Total Nitrogen as N 15,9 kg/ton; Total phosphorous as P 3,0 kg/ton; Potassium as K, 42,5 kg/ton; Magnesium as Mg, 2,2 kg/ton; Sulfur as S,5,7 kg/ton. .
Retrogradation. Starch crystallisation. Linear chains of starch are able to form crystalline structures - crystallites - causing staling in bread and milky appearance or syneresis in starch gels. Second Generation. With new improved cellulolytic enzymes a whole crop can be turned into biofuel, meaning that both starch and cellulose can be digested. This improves yield or make it even possible just to use the cellulosic parts of the plants saving grain for human nutrition. Second generation biofuel is made that way. This principle may just as well be applied in the process of making starch sweeteners like glucose and for beer etc. Direct hydrolysis of combined starch and cellulosic material increases yield and may do away with cumbersome filtration of cellulosic fibres. Sorbitol. Sorbitol - a sugar alcohol - obtained by hydrogenation of glucose. Syneresis. 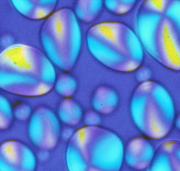 The free setting of water from a starch gel caused by retrogradation. Total Sugar. Total sugar is high DE-dextrose syrup solidified by evaporation and subsequent instant crystallization. Vegetable oil. Cooking oils are edible oils extracted from olives, soybeans and oil seeds. Waxy Tapioca. CIAT began development of a waxy tapioca with 100 % amylopectin. Whitefly. Pest (Mealy bugs) Phenacoccus manihoti, attacks cassava crops. Xanthan gum - a fermentation-produced polysaccharide. Xanthan is used as a viscous food additive. It is made by fermentation of glucose by Xanthomonas campestris bacterium. Yellow dextrin or Canary dextrin. Produced by roasting acidified starch. It is cold water soluble. Used as a glue and has a good tack.